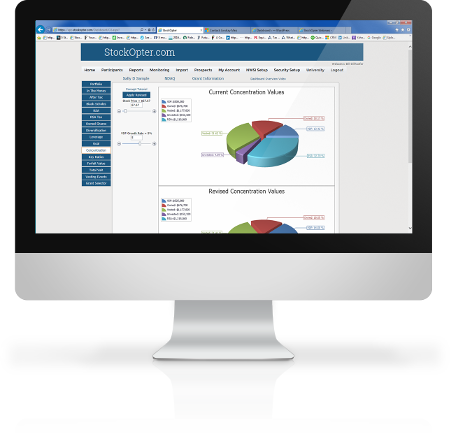 StockOpter reports provide stock plan recipients with the information they need to know to make timely and informed decisions regarding their equity compensation grants. These "template based" documents are highly customizable and contain information that is NOT provided via stock plan administation platforms. StockOpter Personal Equity Compensation Profile: includes both grant based information and personal information such as owned share value, concentration percentages and goal attainment graph. This report is often provided by a financial advisor. The StockOpter Report Presentation Guide provides additional guidance on reviewing and explaining the personal equity compensation profile report. Sample StockOpter RSAs ONLY Report: designed specifically for individuals that have restricted stock/unit grants and company shares that they own outright. This NEW report facilitates prudent diversification decisions by valuing these holdings, illustrating risk/reward and proposing a decision framework. For more information about the concepts contained in these report view the Concept Videos section of this blog.